The Richmond Daily Dispatch notes that some of Sherman’s cavalry troops are being housed as prisoners in Richmond. Even for dirty Yankees, these appear to be noteworthy. It’s not surprising, considering that they have been living rough with very little baggage since last September. No doubt they look very different from the Eastern troops the Virginians are used to seeing. While the paper doesn’t mention it, it must strike the inhabitants of Richmond as ominous that Sherman is now close enough for captured troops from his force to reach the Confederate capital. We are still without official advices from North Carolina later than General Johnston’s report of the battle of Bentonsville, which we published more than a week ago. When last heard from, Sherman was at Goldsboro’, and we think it likely he is still there, resting and recruiting his men after their tramp through South Carolina. The Yankee papers say he will next direct his columns against Raleigh. Four hundred and eighty of Kilpatrick’s men, captured by Hampton at Fayetteville, reached this city yesterday. 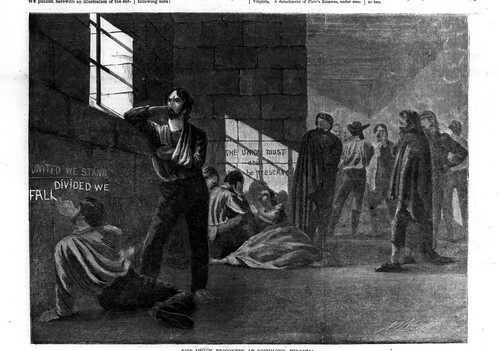 They constituted, by all odds, the nastiest lot of Yankee prisoners that have darkened the streets of this city during the war. It is scarcely possible to conceive how men could be so filthy, and live. Evidently, they had all been strangers to soap, water and combs since they set out from Atlanta last summer. This entry was posted in Hugh Judson Kilpatrick, Sherman's March, Virginia, Wade Hampton, William Tecumseh Sherman. Bookmark the permalink.